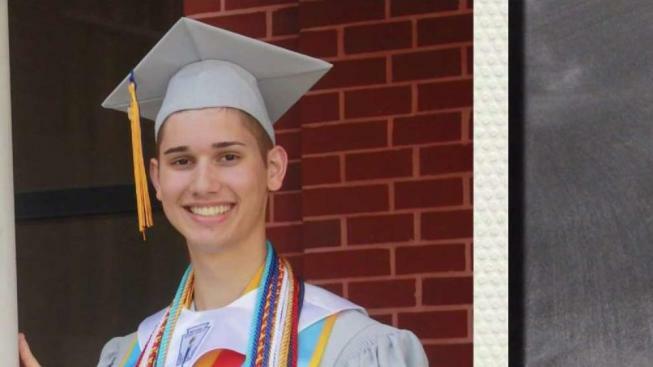 "He has had so much support and so many people reach out and say, 'You're not alone' and 'It gets better'"
An 18-year-old from Florida was all set to attend Georgetown University with a partial scholarship. Then, his parents learned he was gay, kicked him out and said they wouldn't pay the remainder of his tution. News4's Mark Segraves tell how Seth Owen's "chosen community" stepped up to help. A high school valedictorian with dreams of going to Georgetown University suddenly found himself homeless, with his college dream slipping away. Seth Owen says his parents kicked him out and refused to pay his college tuition after they learned he was gay. But his "chosen family" stepped up to help him, starting a tuition fund that had raised more than $95,000 as of Wednesday evening. Owen, 18, said he was devastated to be rejected by his parents and made to go to gay conversion therapy in his hometown of Jacksonville, Florida. "In letting me walk out the door, they were saying, 'We don't care where you're staying. We don't care if you're safe. Our religious beliefs are more important,'" he told First Coast News, which was first to tell his story. The star student's father suspected his son was gay after scrolling through his phone and seeing a photo. Owen said the photo wasn't "inappropriate," but it was enough to raise questions for his dad. His parents, strict Christians, questioned him for hours. They sent him to their Baptist church for therapy. When Owen told his parents the therapy didn't change his sexual orientation, they kicked him out. Owen was accepted to Georgetown and received a partial scholarship. But he still had a $22,000 annual bill and no idea how to pay it. He told university officials his financial situation had changed and that he needed more help, but they refused. Then, his teachers pitched in. Teacher Kim Martin started a GoFundMe page. She said she wanted to help her student though Georgetown officials would not. "It's almost like they don't care about his situation, and it's heartbreaking," she told News4. If Georgetown reverses their decision or if the fund raises more than Owen needs, he said he plans to use the money to help young people in similar situations.